I have been painting portraits for private clients and creating illustrations for publication for over a decade. I am available to create portraits of infants, children, adults, dogs, cats, horses and animals of all kinds, as well as homes, vehicles, and boats. A portrait painting is a wonderful way to celebrate or commemorate the special moments and people in your life, or to give a gift that will be a treasured heirloom. Two sample price scales are provided below. The "classic" portrait is an affordable traditional watercolor portrait created based on your provided personal photographs. The "deluxe" portrait is for the client wanting a creation similar to my personal fine art work, involving more expressive or experimental use of media or more elaborate subject matter. I am also happy to discuss commissions that may not fit within these parameters on an individual basis. To inquire about a commission, please e-mail me at joanna@joannabarnum.com to begin the discussion. Additional details about my commission process are at the bottom of this page. I am also happy to discuss illustration projects for commercial publication or licensing of existing works. Pricing for commercial work varies based on the scope of the work and the rights needed. Holiday portrait commissions now closed! Gift certificates are still available upon request. I can still accept commissions that do not need to be delivered by December 25. Thanks for your support! 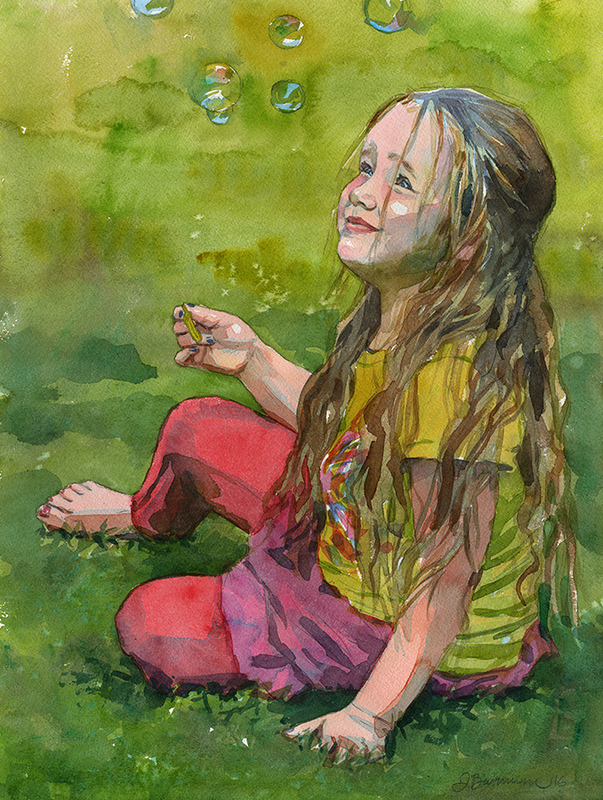 The classic portrait is a traditional watercolor style based on your provided personal photos. The best reference photos are medium to high resolution, in clear focus, taken without a flash. I will do my best to work with the photo of your choice, but I may need to reject reference photos that are too small or unclear. I can also combine separate reference photos of different people or pets into one painting. Extraneous backgrounds can be replaced with an expressive wash in color(s) of your choice, or an interpretation of the existing environment can be included. You will have a chance to preview a preliminary drawing and request changes before the final painting is completed. These prices are a general guideline. Special requests may be priced differently, to be discussed before a deposit is made. Custom sizes are also available. The deluxe portrait is for the client wanting a creation similar to my personal fine art work, involving more expressive or experimental use of media or more elaborate subject matter. Depending on your location, I may meet with you to shoot photos, or I will coach you through taking your own photos that will work for the project. The process will include mutual discussion and brainstorming to arrive at the final concept for your fully custom artwork. These prices are a general guideline. and may vary depending on the parameters of the specific project. "Modern Love" is a portrait of a married couple, an exploration of the idea of two people looking in the same direction together, separate individuals, yet the borders between them blurred at times. "Memento Mori" is a self portrait where I combined a skull and flowers with my own image. There is no limit to the type of imagery that can be combined with a portrait, such as wedding flowers, pets, favorite animals, a landscape you feel connected to, or any other symbols of personal significance. "Generations" is a portrait of a grandmother and granddaughter. Visit my "Lost Edges & Simultaneous Realities" portfolio for more ideas. To inquire about a commission, please e-mail me at joanna@joannabarnum.com to begin the discussion. If you are inquiring about a classic portrait, please attach the reference photo(s) you are considering to your e-mail. The best reference photos are medium to high resolution, in clear focus, taken without a flash. I will do my best to work with the photo of your choice, but I may need to reject reference photos that are too small or unclear. I can also combine separate reference photos of different people or pets into one painting. By sending me a reference photo to work from, you are granting me permission to create a derivative work based on it. In the case of a photo taken by a professional photographer, you are responsible for obtaining permission from your photographer to use the photograph in this manner. Resulting artwork may be displayed in my portfolio or used for promotional purposes unless requested otherwise. Feel free to use your commissioned portrait for any personal purpose, but you may not use it commercially without my permission. (Commissions for publication are priced differently depending on rights required.) If you display it on your personal Facebook page or non-commercial website, please include a link to www.joannabarnum.com below it. A 50% deposit is required to begin work. I accept payment via Paypal, check, or money order sent directly to the artist, or I can create a custom shop listing through this website's shop or Etsy for you to purchase if you prefer. The balance is due upon digital preview of your finished piece. Your original portrait will be shipped once it is paid in full. Shipping fees are approximately $6-$20 depending on size and number of portraits being shipped. I am happy to ship internationally. I am not responsible for any additional customs fees that may apply to international packages, and tracking/insurance may not be available for international packages. Domestic shipping fees include priority mail, delivery confirmation, and insurance. I pack your artwork carefully to prevent damage in transit. Please allow 2 weeks-1 month for completion of your classic portrait during most of the year. The process for deluxe portraits may take longer. If you need your portrait by a particular date, let me know, and I will let you know if this is possible. Rush fees may apply for tight deadlines. December 1 is usually the final deadline for portraits needed by Christmas, and January 20 is usually the final deadline for portraits needed by Valentine’s Day, but commissions may be cut off sooner depending on my work load. You will have the opportunity to approve and request revisions to a preliminary drawing for all portrait options except for the “quick pet marker drawings.” “Quick” drawings are a bargain one-shot process with no revision stage. I can create professional quality inkjet prints of your commissioned work if you need extra copies for gift giving. The print prices below for extra copies of commissioned work are discounted from my usual fine art print prices. I do not provide framing services at this time. Please support your local independent framer! All original artwork on paper should be framed with a mat or spacers- glass pressed directly against original artwork may damage it over time. Choosing an acid-free mat and backing board and UV filtering glass or plexiglass is also a great way to preserve your original artwork for generations to come. For local clients, here are some of the custom framers I recommend that I have worked with personally. Tell them I sent you! If you want to go “DIY,” but still have access to professional quality acid-free/archival materials and UV filtering glazing options, check out Frame Destination online. Their framing arrangements ship mostly assembled, but will require you to mount your artwork inside the frame using linen tape (not included, but can be ordered separately from the same website) and to install the included hanging hardware on the back of your frame. Their customer service is excellent. All content © Joanna Barnum unless otherwise noted, and may not be used without permission.